After independence, development of the rural sector was considered the primary concern of the Government of India. In 1949, with the appointment of the Radhakrishnan University Education Commission, imparting of agricultural education through the setting up of rural universities became the focal point. Later, in 1954 an Indo-American team led by Dr. K.R. Damle, the Vice-President of ICAR, was constituted that arrived at the idea of establishing a ‘Rural University’ on the land-grant pattern of USA. As a consequence a contract between the Government of India, the Technical Cooperation Mission and some land-grant universities of USA, was signed to promote agricultural education in the country. The US universities included the universities of Tennessee, the Ohio State University, the Kansas State University, The University of Illinois, the Pennsylvania State University and the University of Missouri. The task of assisting Uttar Pradesh in establishing an agricultural university was assigned to the University of Illinois which signed a contract in 1959 to establish an agricultural University in the State. Dean, H.W. Hannah, of the University of Illinois prepared a blueprint for a Rural University to be set up at the Tarai State Farm in the district Nainital, UP. In the initial stage the University of Illinois also offered the services of its scientists and teachers. Thus, in 1960, the first agricultural university of India, UP Agricultural University, came into being by an Act of legislation, UP Act XI-V of 1958. The Act was later amended under UP Universities Re-enactment and Amendment Act 1972 and the University was rechristened as Govind Ballabh Pant University of Agriculture and Technology keeping in view the contributions of Pt. Govind Ballabh Pant, the then Chief Minister of UP. The University was dedicated to the Nation by the first Prime Minister of India Pt Jawaharlal Nehru on 17 November 1960. The credit for starting the functioning of the University without losing any time goes to the warm and resourceful personality of the first Vice-Chancellor, late Dr. Kenneth Anthony Parker Stevenson (1-12-58 to 2-1-64), who could keep people fruitfully engaged on the university farm, the labs and the classrooms despite the lurking fear of wild animals roaming the area. The other Vice-Chancellors to be remembered for their distinctive contributions in the development of the University are. 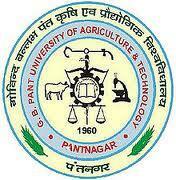 GB Pant University Of Agriculture & Technology, Pantnagar has 3 affiliated Colleges. Click here to explore them. GB Pant University Of Agriculture & Technology, Pantnagar has 93 Departments listed that offer various academic courses. Are you Interested in studying at GB Pant University Of Agriculture & Technology, Pantnagar? This page was last modified on 7 March 2016 at 17:03.